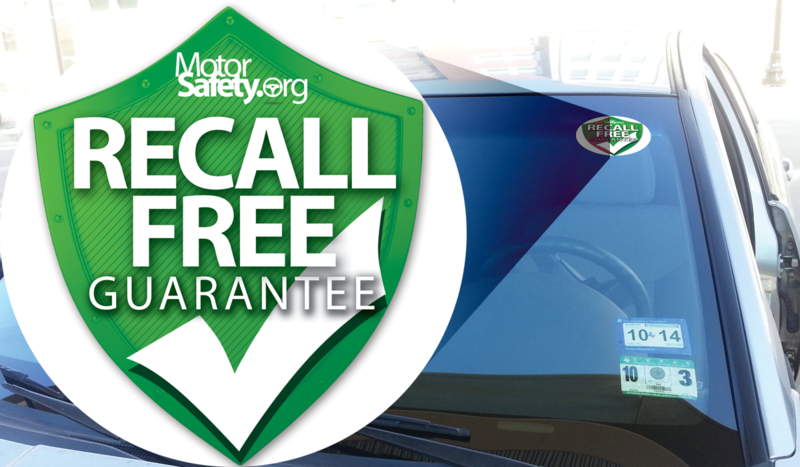 Dress Up Your Dealership & Show Off Your Commitment to Safety! For use on pre-owned or new car inventory, the mirror hanger is made of a durable card stock with a UV coating to secure usage with multiple vehicles that may be exposed to harsh sun exposure. 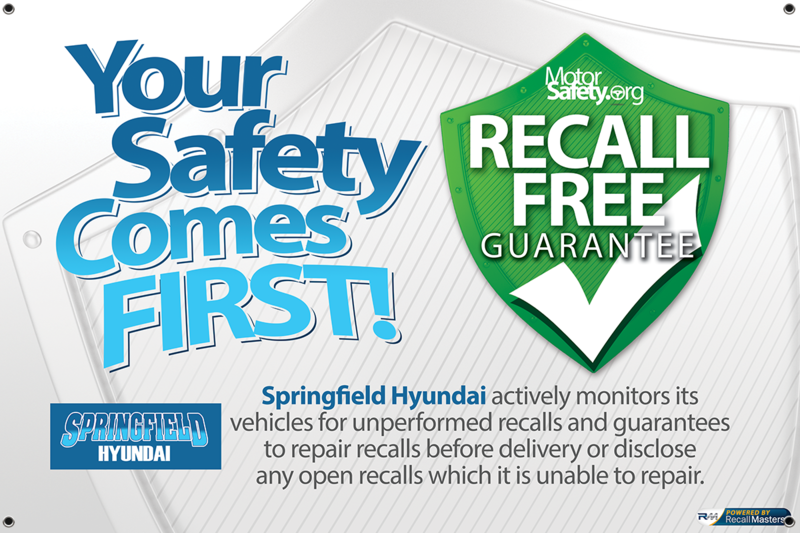 Includes a description of your dealership’s commitment to recall monitoring. 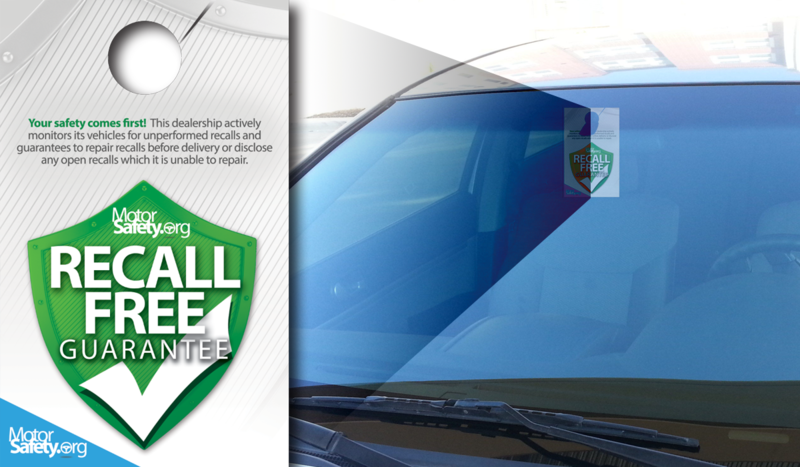 For use on new car inventory, the vehicle sticker is made of a durable vinyl material with a UV coating to withstand prolonged exposure to external environmental conditions. Here’s the sad truth – consumers dread sitting in your service department, especially to fix a recall! Use these promotional gift cards as an incentive to get consumers in the door or to keep them coming back. Chances are, about half of these recalled vehicles need additional repairs. Wouldn’t a gift card come in handy right about then? 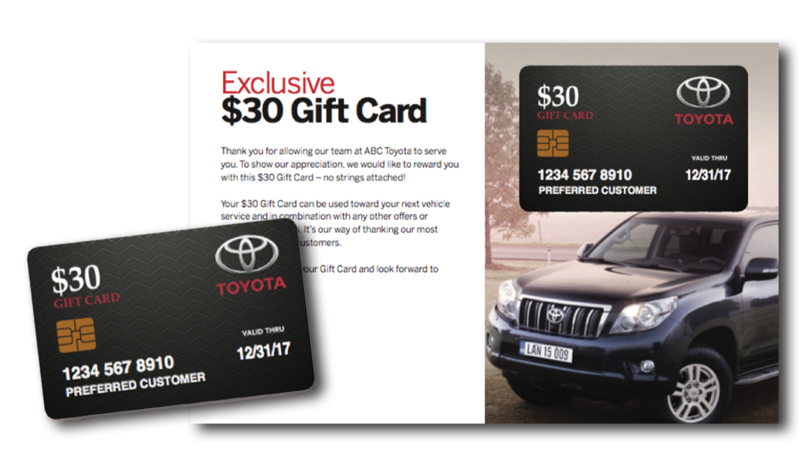 For those that don’t require repairs, they can either use the gift card for accessories, parts or hold onto it for a future visit. Read more about this solution! Let your customers and shoppers walk into your showroom, Sales Department or up to the Service Department with confidence knowing that you’re looking out for their safety. This customized hanging banner features your dealer logo, website address and dealership colors. The 6-foot by 4-foot vinyl banner contains grommets on each corner for easing hanging. First impressions are everything! This is especially true of the shopping experience, as car buyers are accustomed to choosing on price alone. 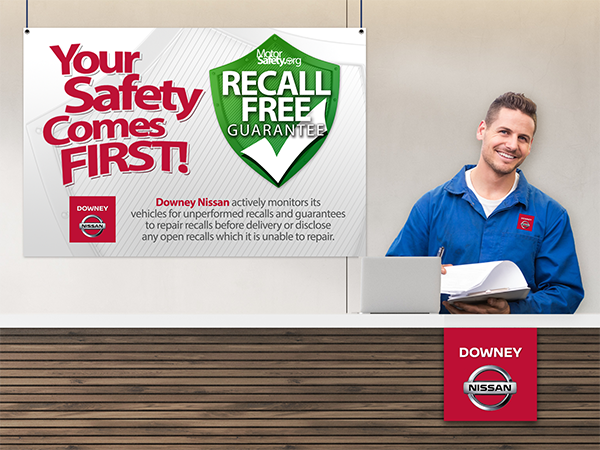 Carefully position these banners to greet customers, letting them know that your dealership and its inventory are different. Give your customers the confidence to buy from you! These tall, vinyl banners retract into its aluminum base for easy repositioning to a new location. 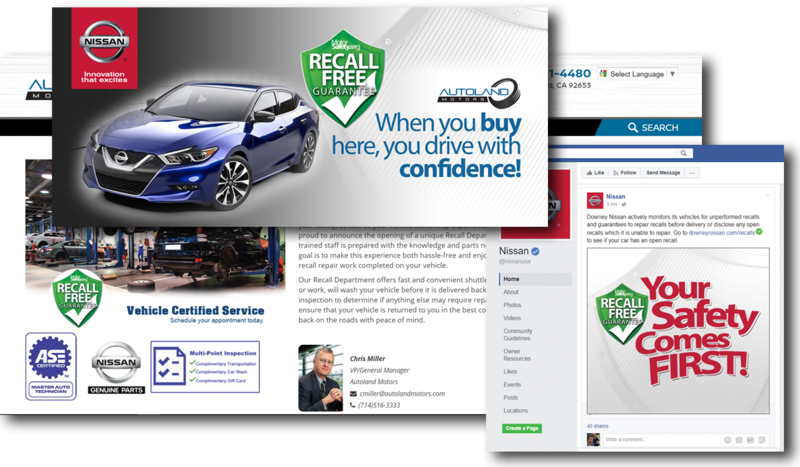 Your Recall Department webpage is actually a lead generator for your dealership, but you have to promote it to site visitors and on your social media properties. 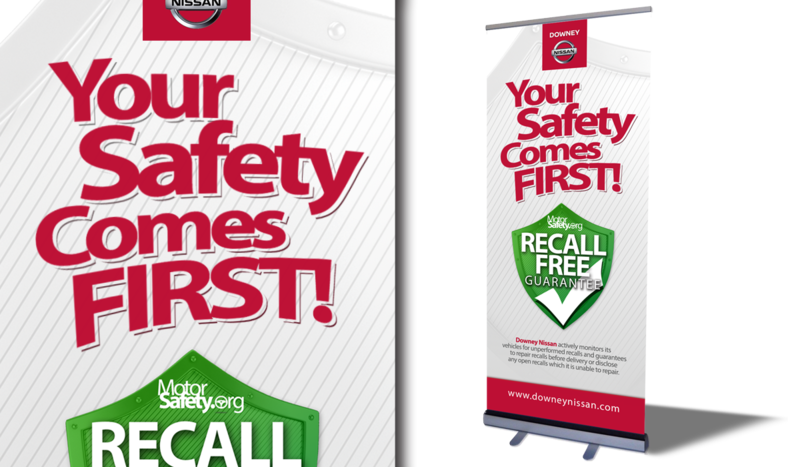 Recall Masters can help you with web banners, Facebook posts, art for waiting room monitors – let Recall Masters help you get the word out! Submitting this form assumes that you are a Recall Masters client or a prospective client. Your account will NOT be charged for any POS materials until we can confirm your account status and that the request is coming from a dealer representative authorized to request the respective materials. Some POS solutions have a cost associated with them. A client manager from Recall Masters will discuss the cost and shipping details with you. When confirmation is received, Client Services will invoice your account.